The scientific-methodical journal “Filologiya masalalari” (“Problems of philology”) has been published since 2002, four times a year. The Provision of the journal was adopted by the Resolution of the Council Meeting of the Ministry of Higher and Secondary Specialized Education as of January 31, 2002. The Journal has been registered by the Press and Information Agency of Uzbekistan on February 2, 2007. 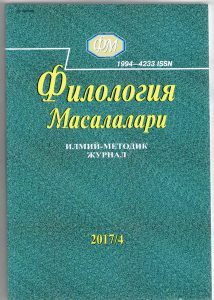 The scientific-methodical journal “Filologiya masalalari” is included in the list of leading peer-reviewed scientific journals recommended by the Higher Attestation Commission, in which the scientific results of dissertations for Masters, PhD and DSc degrees on philological and pedagogical sciences, as well as the results of works of outstanding scholars of the Republic are published. In April 2007 the journal has got an international certificate ISSN 1994 – 4233. “Filologiya masalalari” publishes articles on the following branches of science: topical issues of the development of linguistic education and language training in the system of continuous education; topical problems of translation studies; discourse analysis in linguocognitive studies; lingvoculturology; psychological and pedagogical problems of cognitive activity, problems of linguodidactics; theoretical and methodological problems of studying foreign languages, introduction of modern innovative methods of teaching foreign languages. Editorial council: Laylo Akhmedova, Dee Broughton(USA), Rafael Gusman(Spain), Jamoliddin Yakubov, Abbos Iriskulov, Shavkat Karimov, Shavkat Sharipov, Steve Macnulty(Director Of The British Council), Elmira Muratova, Rodmonga Potapova(Russia), Ganisher Rahimov, Nuriddin Safaev, Shuhrat Sirajiddinov, Bakijan Tukhliev, Irina Khaleeva(Russia). Editorial board: Khurshid Dustmukhammad, Dilbar Djumanova, Nilufar Isakulova, Nosir Kambarov, Venera Kayumova, Anatoliy Lixodzievskiy, Oynisa Musurmanova, Patkhiddin Nishonov, Khalifa Paluanova, Gulchekhra Rikhsieva, Halim Saidov, Dilfuza Teshabaeva, Iroda Turamuratova, Guli Ergasheva, Gulnoz Xallieva. Publishing House address: Uchtepa, Kichik Halka yuli, 21– a. Subscription index for individuals – 943; for organizations – 948.